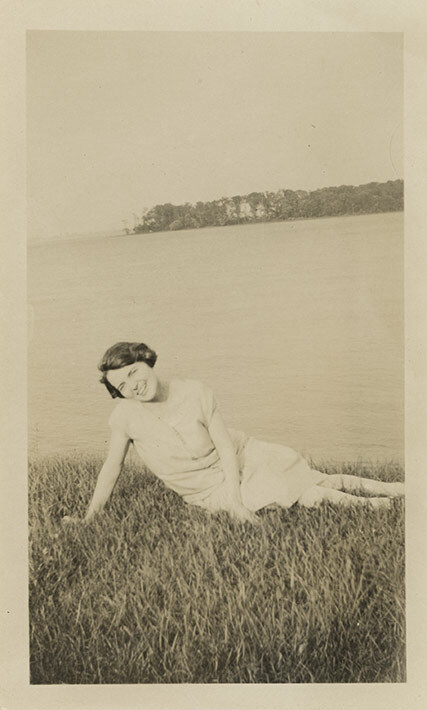 This is a black and white photo of Luisa Guagneli lying on the grass in front of a body of water, possibly a lake. She is wearing a light-coloured mid-calf length dress with short sleeves and buttons at the front. Her short bob is parted to the side. She is smiling at the camera and leaning her head towards her right shoulder. The background shows a shoreline lined with tall trees on the other side of the lake.